The IEA predicts that global gas demand growth will be led by a surge in the construction of gas fired generation capacity. The growth in gas demand from the power sector will increase the requirement for gas supply flexibility. At the same time Europe and Asia are set to become increasingly dependent on imports of LNG. This will drive a closer relationship between regional power prices and the increasingly complex dynamics of global gas pricing. It is also likely to result in an increase in the value of flexible gas infrastructure. In their recent Golden Age of Gas report, the IEA predicts that global gas demand growth will be led by a surge in the construction of gas fired generation capacity. They forecast that annual gas consumption from gas fired power stations will increase by 800 bcm to over 2000 bcm by 2035, an increase of 65% from 2008 levels. This is equivalent to more than 1500 new 500 MW CCGTs running at 75% load factor. it is ideally placed to provide the flexibility required to manage renewables intermittency. In Europe policy makers have been slow to recognise the key role natural gas is likely to play in the transition to decarbonisation of the power sector. This is to a large extent because governments are promoting a much more aggressive path for development of renewable generation than that supported by policy mechanisms and transmission infrastructure. The European Gas Advocacy Forum recently published a interesting study which sets out how gas can play a more prominent role in meeting 2050 European emissions targets than that presented in similar studies by the European Climate Foundation and the UK Committee for Climate Change. In Asia and North America the case for gas fired power generation is clear. A pollution driven transition from coal to gas plant in China and a reduction in Japanese nuclear capacity will support Asian demand growth. Gas fired generation also looks attractive in North America given the scale of domestic shale gas resource and a policy shift towards lower carbon emissions. Globally the growth in gas fired generation capacity will drive a greater requirement for imports of LNG. This is particularly the case in Europe where declining domestic reserves will need to be replaced with imports and in Asia where demand growth is set to outpace supply as illustrated in Chart 1. The growth in gas demand from the power sector will increase the requirement for gas supply flexibility. Almost universally, either through central dispatch or market mechanisms, generation dispatch decisions are based on the relative short run marginal cost of power plants. As a result the running patterns and gas demand of gas fired plant can vary significantly as a function of gas prices relative to other fuels (primarily coal). The resulting swings in power sector gas demand may be seasonal (as a result of winter/summer gas price differentials) or more structural as global commodity price movements impact the competitiveness of gas-fired generation. Growth in intermittent renewable capacity will also drive an increase in the requirement for short term gas supply flexibility. Gas power stations will play a prominent role in providing flexibility to compensate for fluctuations in ‘must run’ wind and solar generation output. The extent to which this gas flexibility is required from one year to the next will in turn depend on variations in alternative sources of short term flexibility such as hydro storage levels. Another important consequence of growth in gas demand for power generation will be an increasingly strong relationship between gas and power prices in many regional power markets. An expansion of gas capacity combined with the flexibility demands of ‘must run’ renewable capacity is likely to result in an increase in the influence of gas plant in setting marginal power prices. This will manifest itself both in an increased correlation of gas and power prices and in a convergence of the shape of prices. An increased requirement for gas supply flexibility from the power sector is set to coincide with the increased dependence of Europe and Asia on LNG imports. The dynamics of LNG supply are very different to traditional contracted pipeline supply. Incentives to economically optimise the destination of LNG cargoes are a well established feature of LNG supply contracts. As a result the delivery of LNG to meet demand will depend on market price signals and the location of suitable cargoes. The continued development of global LNG spot trading and arbitrage combined with greater sources of supply diversity will lead to less predictable production to market routes which will require greater transportation and storage infrastructure flexibility. This infrastructure flexibility will need to support the fluctuations in regional power sector gas demand from changing wind patterns, hydro levels and gas plant competitiveness. It will also need to support the dynamic re-optimisation of global LNG portfolio flows in response to complex interactions between regional spot gas and contract prices. 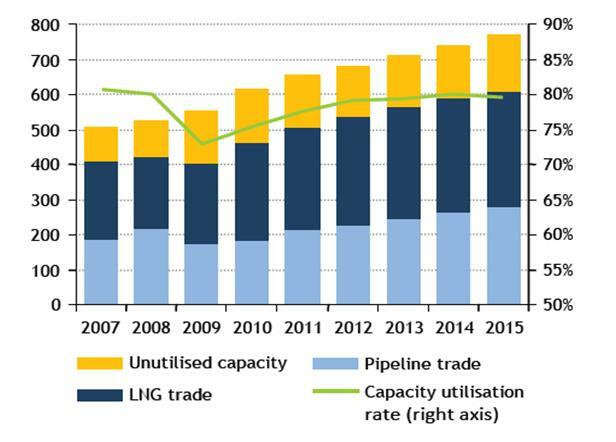 The IEA provide an insight into how global LNG capacity utilisation may tighten by 2015 in their recently published Golden Age of Gas Scenario. Chart 2 shows the historic and forecast global pipeline and LNG trade and transportation infrastructure utilisation capacity. The IEA project global gas demand this decade will be driven strongly by Asia meaning that unutilised LNG capacity will fall quicker than that of pipelines. As capacity becomes more constrained towards the middle of the decade it is questionable whether the global gas supply chain will have the inherent flexibility required to manage the uncertainty in global and regional supply and demand balances. This is both over a medium term (seasonal and forward curve) horizon and a short term (within month) horizon. In this environment there is an interesting investment case for emerging technologies that can add flexibility to the gas supply chain. In addition to existing floating regasification facilities these include floating liquefaction, compressed natural gas (CNG) and small scale LNG transportation. There is still time for investors to deliver new supply chain flexibility although investors have been wary of commiting capital. There is a risk that policy and regulatory uncertainty will provide siginficant impediments to investors seeking to finance investments in flexible infrastructure. For example the lack of clarity in Europe as to policy support for new gas infrastructure and the role gas will play in the decarbonisation agenda. Flexibility development may be further hindered by the fact that asset margins are a complex function of market spreads and price relationships. These can be difficult for investors and asset managers to quantify and to hedge. However if investment in flexibility is constrained it will likely result in greater gas price volatility and an increase in the returns and asset value of existing flexible gas infrastructure.